Campus recruiting is one of the very first career events we’re exposed to as a job seeker, and many talent acquisition professionals cut their teeth in the world of campus recruiting. While the schedule can be grueling, especially during high-volume recruiting times (like nearing graduation), the exposure, especially to one’s target schools, is nearly unparalleled. Campus career fairs can be a boon to your talent pool and pipeline, especially when done right. So first, identify your plan. What is your specific goal for this school? Is it a new school for your company or do you have an established presence there? Are you sending people well-versed in your culture and needs, or whoever is closest? For many companies, too little time is spent on the planning and goals of the event. Instead, focus on preparing as you would for any event. It is crucial to create a long lasting relationship with schools who align with your industry, are in your area and who reliably produce graduates who fit well within your company. However, as the workforce shifts and people’s goals for their own careers start to change, consider whether new schools should be added to the mix. For example, many companies are starting to hire from coding camps, technical schools and alternative MBA programs. While not all of these factors should be given the same weight, it’s important to consider each carefully. One of the best ways to see how your spend and resource allocation is working is to track your events through a recruiting platform geared toward tracking events. These systems provide in-person applications, a CRM to track source of contact and follow up with appropriate candidates and metrics to allow you to measure whether certain events are worth your time and effort. Round up the troops. Maximize your investment by taking along someone who knows the campus. Perhaps you have an employee who attended that university or a recent hire who can speak to soon-to-be-grads about entry level opportunities at your company. ロ Make sure everyone you bring along has the ability to quickly scan or enter contact information. ロ If you use a university recruitment platform, ensure it’s optimized for mobile, so you can use phones or tablets if the career fair promises to be a busy one. Maximize faculty friends. If you already have contacts within the school you’re visiting, now is the time to look them up. ロ If you have an inside contact at the career center, an affiliate program, relationships with student organizations or faculty relationships within the industry focused schools on campus, use them to spread the word about your attendance. ロ Whether you hand out interview guides to your career center pals, fact sheets about your positions to teachers or a postcard to nab free swag at your table, take a page from marketers and incentivize your campus contacts to let their students know you’re there! Promote your presence. Again, a university recruitment platform makes this dead simple. If you’ve built out your talent pipeline and have CRM records of candidates you’ve spoken with in the past, now’s the time to let them know you’ll be there again. ロ If other companies are going to be presenting, make sure to find out what they’re doing and don’t forget that university students are social creatures: SnapChat, Instagram, Twitter and even Facebook can help you publicize your booth. ロ Mobilize those social media channels as well! Send out emails, text messages and social media ads publicizing your booth and what students can expect when they get there. Go above and beyond. Consider that most employers arrive later than they should and according to this quote from Shannon Smedstad, they leave early as well. Examine your materials. Are they engaging? Do they teach about culture and skills? Do they give the prospect a next step or contact information? ロ Do you have at least one piece of compelling swag to offer those browsing your booth? If not, consider if your presence there is truly supported. You don’t have to spend big bucks to have quality visual displays or swag. ロ And if you have literature anyway, make sure it answers a candidate’s likely questions as well as gives them a next step. Be present. So many career fairs are filled with boring booths and lackadaisical recruiters. Don’t let this be you! When you equip your recruiters with the technology to collect information about candidates PLUS the steps they need to take once they’ve determined their interest in the job, you win! Get your follow up game together. If you aren’t collecting the data you need at events to follow up with candidates, you’re missing out on the most important parts of a campus event (or any event for that matter!) To follow up in a timely manner, you need to be organized, efficient and ensure your CRM is hooked up to your ATS. Side Note: With Oleeo you can attach the Event product to the Engage product to allow you to seamlessly follow up with candidates post-event. Our Campus solution has Recruit, Engage, Event, Interview and Intelligence all wrapped into a seamless solution. Follow-upafterward. Send impressive candidates follow-up emails or a phone call to set up an interview to see how their skills and experience (or potential experience, they are students after all) match up to the positions you’re vetting for. In order to do so, however, it’s critical to stay organized to keep and reference their information in your Talent Acquisition Software later. ロ Those particularly competitive candidates will be swiped up quickly, so take the time to gather their contact information and call them as soon as possible. ➤ Classroom Sessions or Lunches: Do you recruit from one or more colleges on a campus? Consider holding an informational session in the classroom in conjunction with the dean or a professor there. While these are incredibly powerful on their own to get undivided attention from your grads, you can also pack a one-two punch by doing one before or after a career fair. ➤ Online Communities: Students are eager and willing to learn as much as possible about their new industry. Give them a leg up by creating an online community that publishes reports, industry trends, FAQs about jobs in the industry and even online learning curriculum that will prepare them for jobs in your company. ➤ Hackathons and Contests: Work with the career center to create a hackathon (these aren’t just for computer geeks anymore) in any industry or support one in your space that’s already planned! Either way, it’s a fun and less formal way to get to know students. ➤ Interviews: Once again, the career center and your recruitment event software can be your best friends in creating time outside the traditional career fair times to simply conduct interviews. Have an interview day with those you met at a career fair, or work with professors and alumni associations to fill up a day with pre-selected applicants. The career center can also direct students your way and WILL, if you help provide them with email templates, flyers and guides for their students. ➤ Team Hiring: A huge trend throughout the United States is team hiring. Why NOT extend it to college groups? After all, in many cases, students are already working on teams to complete assignments and projects. ➤ Tech-Enabled Interviews: Don’t have the budget to travel everywhere for events? Try video interviewing and screening. This is an efficient and easy way to see lots of prospects in a limited amount of time. Ready to take your campus recruitment events to the next level? 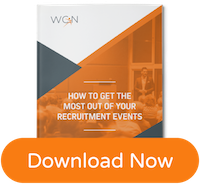 Get started by downloading our Recruitment Events Guide.